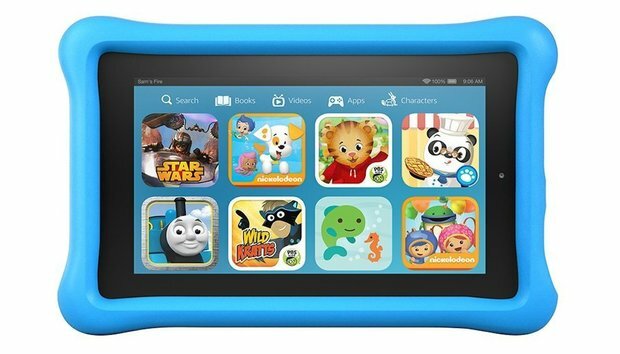 Amazon's Fire tablet comes in a kid's edition, and it's surprisingly well thought out. If you're in the market for a kid-proof tablet that won't break the bank, this is one to consider at just $99. What's more, it's discounted through February 13 so if you buy it now, you only pay $79.99. That's a great deal if you consider the specs. The Fire Kids Edition sports a 7" 1024 x 600 IPS display (wider viewing angle and higher quality colors). There is a 2MP rear-facing HD camera as well as a VGA front-facing camera, so you'll have fun Skyping them from the road. 8GB internal storage is expandable to 128GB via a microSD slot, and Amazon gives you free unlimited cloud storage for Amazon content and photos/videos taken from the device. That should be plenty of storage for a little kid. There's an accelerometer and gyroscopic sensor onboard, and Bluetooth for wireless headphones or microphone connections. Battery life is roughly 7 hours, and it recharges to 100% in about 6. The device comes with 1 year of Amazon Freetime Unlimited, a service that lets your children access more than 10,000 kid-friendly games, books, TV shows, movies and educational apps, all hand curated to ensure your kids can be left alone with them. But if you prefer to further curate, the parental controls are best-in-class. You can decide exactly what your kid can and can't engage with. Controls can be set by content type as well. So if you're comfortable with unlimited access to reading, but want to limit time spent with apps or games, this is completely under your control. There are even controls that limit access to content until certain educational goals are met. If you'd like to allow web browser access, you have full control over that as well. Access to social media is blocked by default. As I said before -- very well thought out. The navigation is big, visual, and easy for a young child to use. It won't take them very long to find their favorite PBS, Nickelodeon or Disney shows or movies. Or new books to read. The Fire Kids Edition supports up to 4 profiles, which means you can fully personalize the device for up to 4 children. Switching between them is painless. The device is ready to go out of the box. No computer connection or software downloads required. What tips the scale all the way in Amazon's favor might be it's 2 year "no questions asked" warranty. If your kids smash it, they'll replace it. It's as easy as that. Through February 13th this device is discounted 20% to $79.99 and includes a kid-proof case. See more at Amazon.